Since our ride originated in Nashville, I solved the transportation problem back to Birmingham by deciding to ride home to Birmingham starting Sunday and finishing late Tuesday night with the help of Boris Simmonds and Nathan Pocus who both rode way out to West Blockton and helped me crawl the last 35 miles home in the dark. Also, Trey Pounds hosted me in Brookhaven on that first day and rode out to find me out on Zetus Rd with a full bottle of gatorade that I desperately needed. 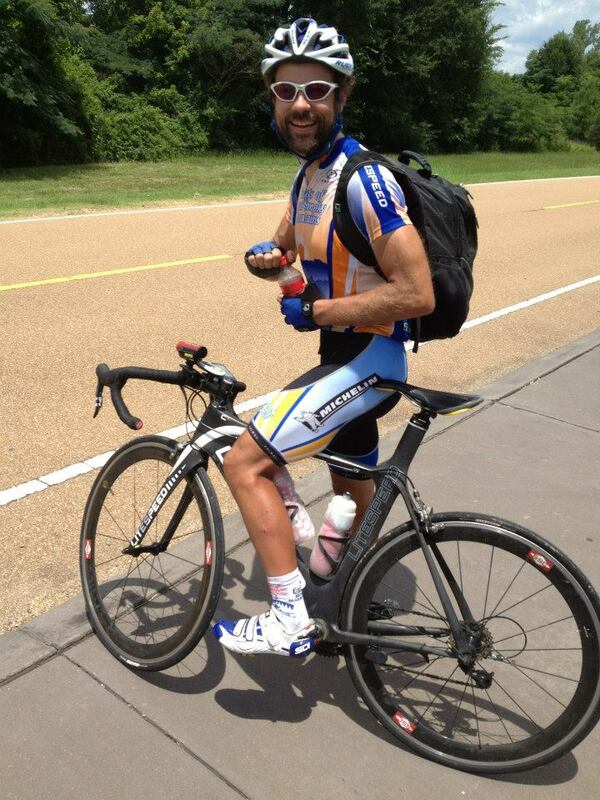 We rode the 15 miles back to his house together and then 30 miles together leaving Brookhaven the next day. 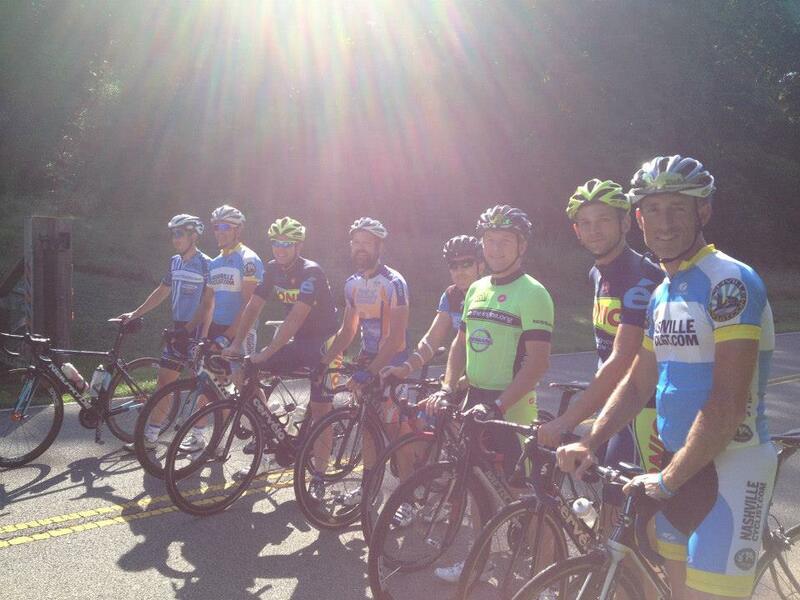 Here’s a recount of the day-by-day including the LP Field criterium in Nashville the night before the big ride. 24 racing miles in the 1/2/3/ crit followed by a short cooldown with the kids exploring the Nashville pedestrian bridge over the Cumberland River. Kristine, the kids, and I drove up from Birmingham to Nashville Wednesday afternoon where we met our cousins in Franklin for dinner at a local Mexican restaurant. I was planning on riding from there over to LP Field for the crit as part of my warm-up, but we were running so far behind schedule when we left Birmingham that there was no way I would make it to the crit in time. In fact, driving over we only made it there about 15 minutes before the start. 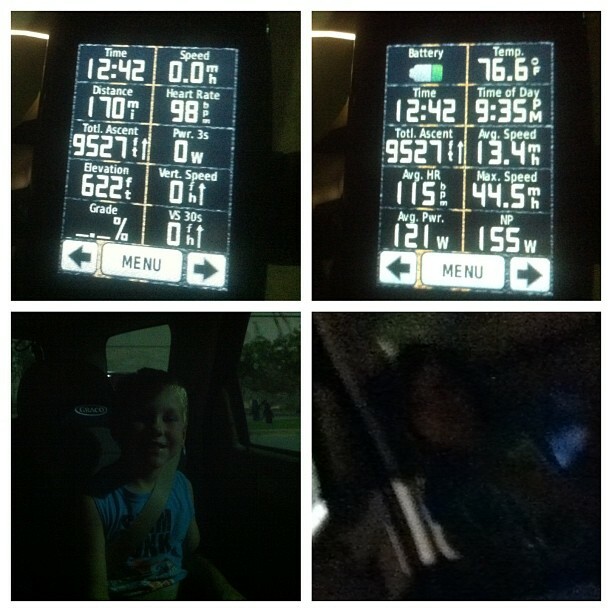 By the time I had the kids bikes unpacked and my bike put together, I had about 8 minutes to warm-up for the crit. Fortunately, Jimmy Grant took a solo flyer and people were content to ride easy for the first several laps giving me an additional few minutes of warm-up before the attacks and counter-attacks began. It was insanely fast for a bit and eventually our field went from 30 or so riders down to about 15 left in the main field. A small group of three got away with a few laps to go and Tim Henry (Litespeed-BMW) went to the front and drilled it hard bringing the break back. With one lap to go, the break was just a couple seconds still in front of us. Ryan Sullivan (UHC/706) launched his sprint first with almost the entire last lap still left to go. Andy Reardon (Cumberland Transit) covered the attack, and then I bridged up to the two of them. Shortly after bridging, I was ready to attack and swung out to go on the outside, but we were just now catching the break and so there wasn’t enough room to get around the riders from the break who were taking up the middle of the road with Ryan and Andy on the inside. I resigned myself to try to come around after the final turn knowing that the finish line was probably too close to get by anybody when Andy clipped Ryan’s wheel coming out of the turn. He didn’t go down immediately but it hit his front wheel hard enough to start a high speed wobble that saw him go into the curb and smash into it with enough force to scare the crap out of me and make me think that when we came around after the finish he would be lying on the ground seriously hurt. I heard afterwards, though, that he had immediately gotten up and grabbed his bike and started to run towards the finish! Wow, Andy is one tough dude! 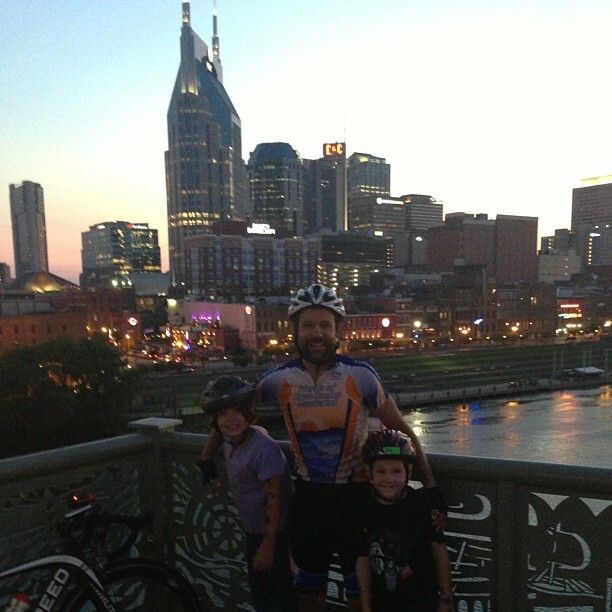 Me with the kids after the LP Field crit doing some fun cool-down riding along the river and on the pedestrian bridge over the Cumberland River. 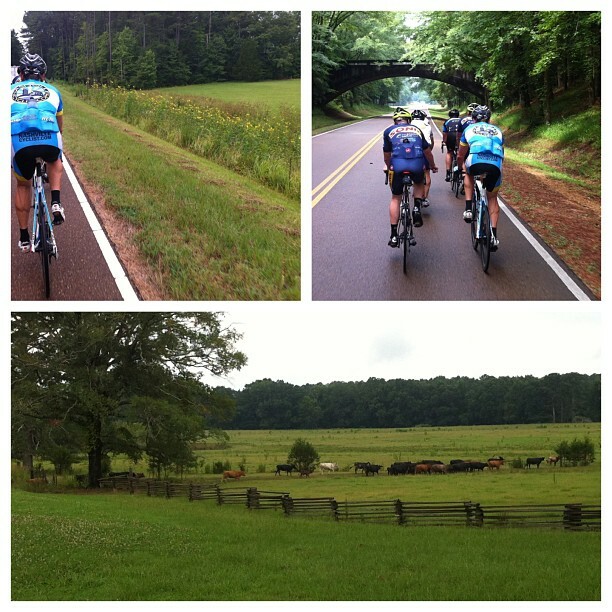 123 fast miles with the additional mile to get onto the trace from the Loveless Cafe. We started out the day at the Loveless Cafe. 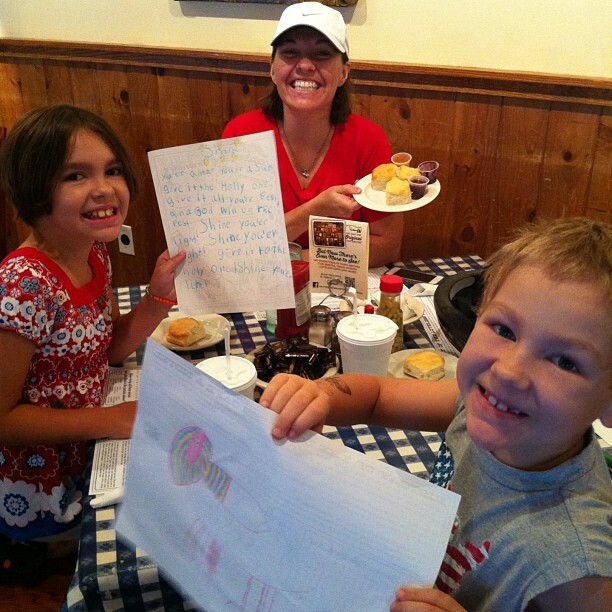 Kristine and the kids were there to send us off after we enjoyed a nice leisurely breakfast at the Loveless Cafe followed by interviews with Channel 4 News in Nashville. 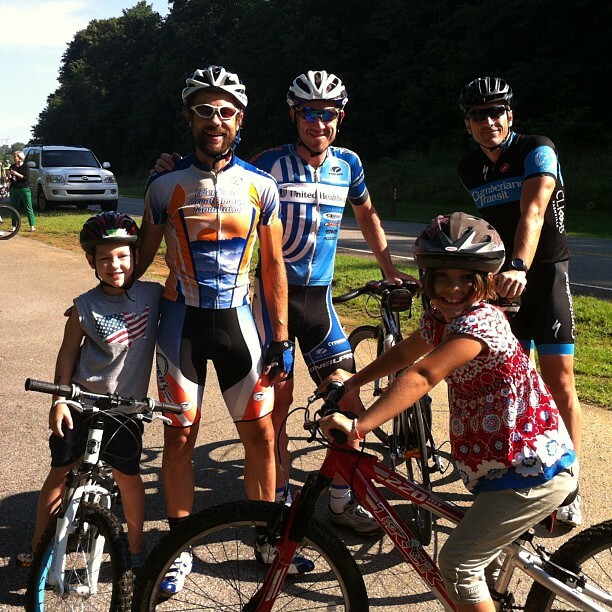 The kids rode their bikes with me for just over a mile along TN-100 from the cafe up and around the long entrance ramp to get to the official start of the Trace. Waving goodbye to Kristine and the kids, I took off after the group after getting a couple last pictures and hugs from Analise and Josiah. Starting out with breakfast at the historic Loveless Cafe near the Nashville terminus of the Natchez Trace. Ben Day from United Healthcare Pro Cycling, joining us for the first two days of our trip, helped turn our 7 man team into an 8 man powerhouse. We got a great paceline going, especially with team captain Tim Hall pulling alongside Ben for 20 minute pulls when it was their turn at the front. I tucked onto the back of the group next to Rick Harris, who had also dropped back to take pictures as we rolled off. We were absolutely flying, and when we stopped for water 40 miles into the ride we barely stopped for a couple minutes before rolling again. We established a two-by-two paceline that we kept for the entire trip. Except with each rest stop, we would inevitably roll-out with a different paceline partner so that kept the conversation engaging and helped us get to know each other a little better. 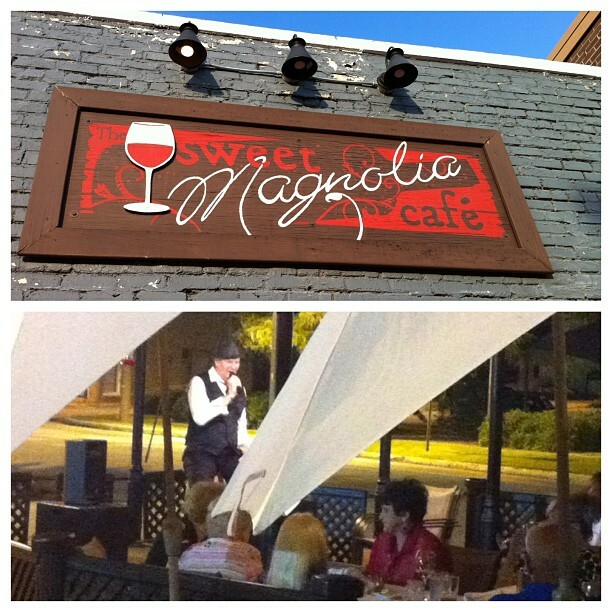 Our first night was spent near Tuscumbia, AL where we went out to eat at a classic restaurant – the Sweet Magnolia Cafe – and were surprisingly serenaded by the cafe owner who sang Frank Sinatra songs for quite a while. It was entertaining! 116 hard miles. Our starting point for the second day was Buzzard Roost Spring – a really cool, large spring bubbling up from an underground cave. We also started up quite an incline at a quite a pace. I was really struggling at the beginning of the ride wondering how on earth I would be able to finish that ride and the rest of the journey! As it turns out, everyone was struggling that morning including Ben Day who later commented that whoever was pulling that first pull was really putting the hurt on! 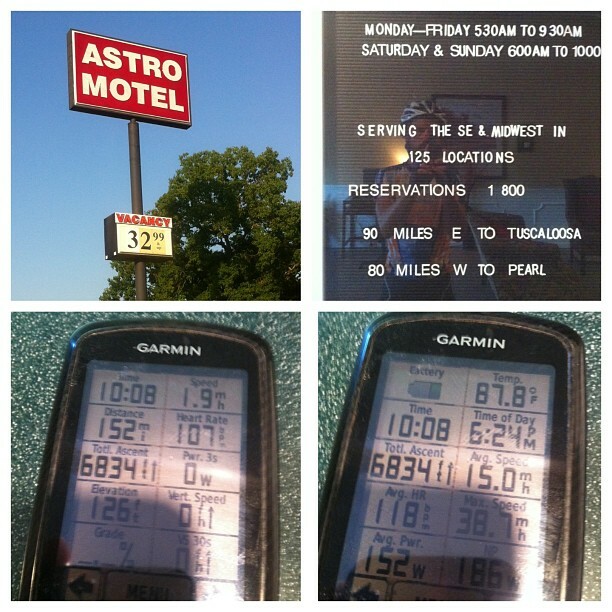 Even with as hard as our start was, we also added in a state line sprint less than 20 miles into the ride as we crossed from Alabama into Missisippi. Check it out in the video below. 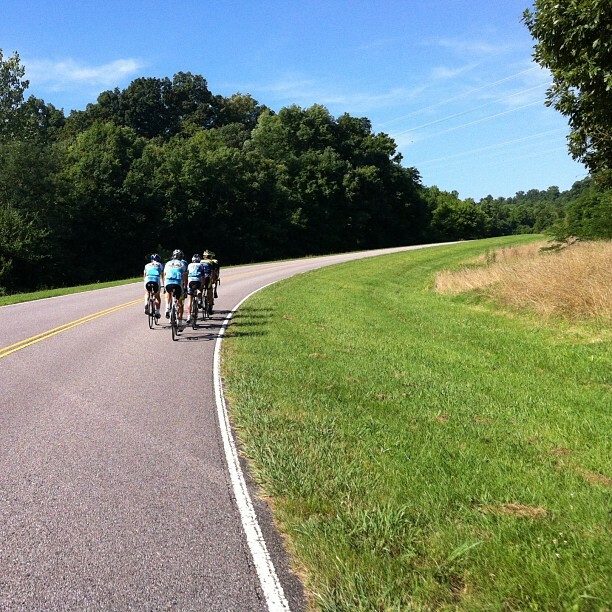 Later in the day as we flew through Tupelo with a bit of crosswinds picking up, the ride continued to be hard and I would rate this day as the hardest of the four days on the Natchez Trace. 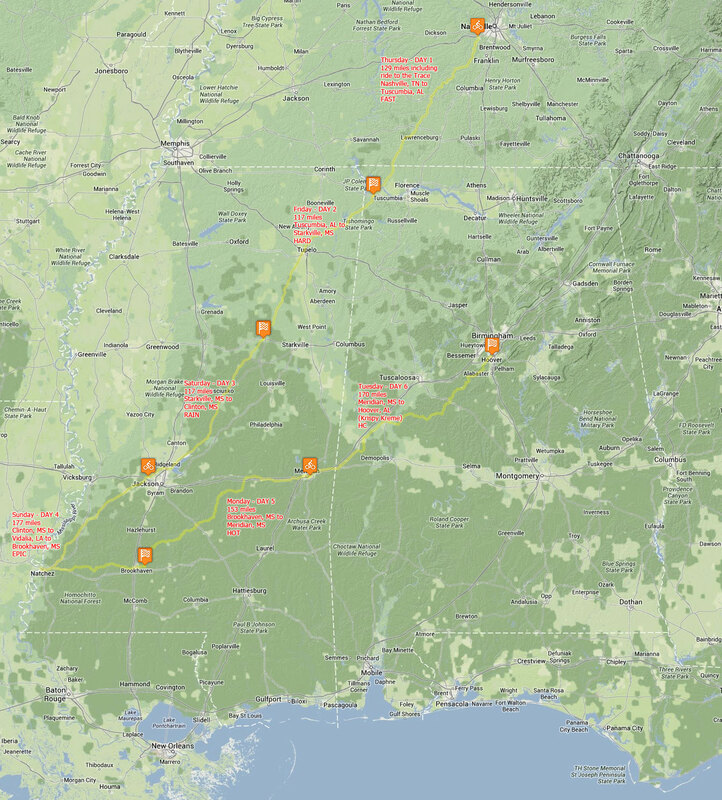 Probably the most meaningful part of the day for me was the April 27th, 2011 tornado damage along the Natchez Trace. 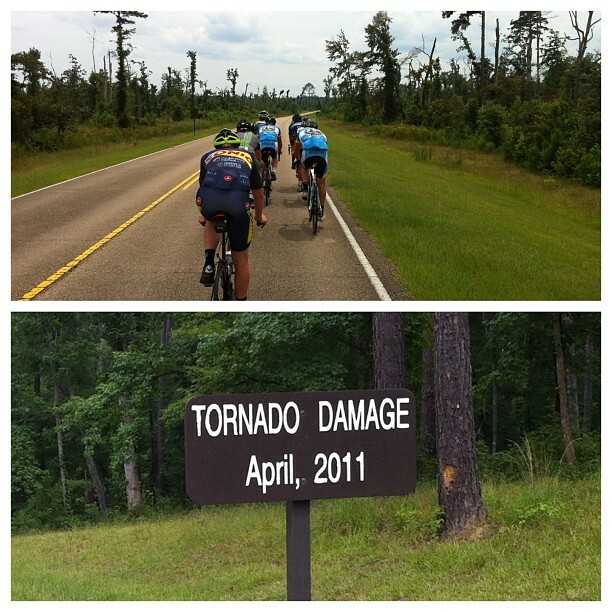 Day 2 – riding through five miles of tornado damage from the April 27th, 2011 tornadoes. These large tornadoes really impacted a lot of Alabama, including the big ones in Tuscaloosa, Birmingham, Cullman, and Decatur. For my own family, Kristine was working in Huntsville and had to thread her way between the morning and afternoon Cullman tornadoes to get home. I was with the kids in the basement when one of the smaller EF-2 tornadoes came over our house. I rolled off the bed on top of the kids and pulled the mattress over top of us because the wind got so severe but thankfully for us it touched down a mile away. One big tree came down in our neighborhood right through somebody’s house – you could see their kitchen from the street. But Cahaba Heights where the tornado touched down got hit really hard with a bunch of trees (a vast majority of the larger trees) in the community knocked over. It would be more than a week before power was restored and some roads were re-opened. 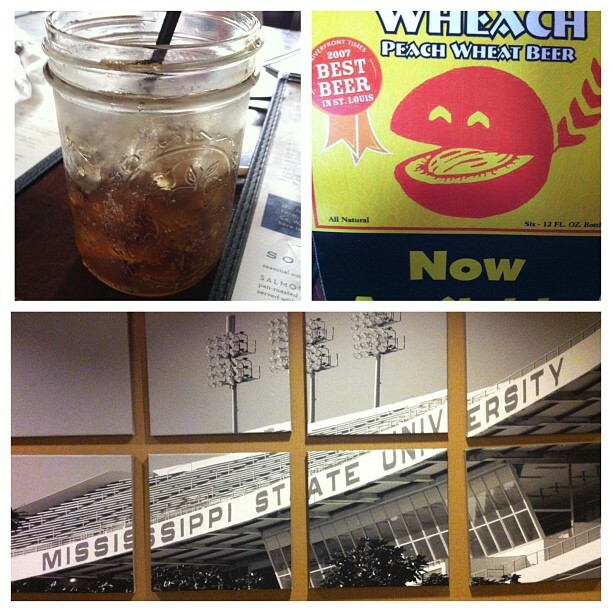 That night, we spent the night in Starkville, MS home of Mississippi State University and ate a cool bar Bin 692 which was walking distance from the hotel. 115 rainy miles. The next morning we woke up to really light rain and a cool coffee shop attached to a gas station instead of a convenience store. It was an interesting coffee shop, cold stone creamery, and gas station all rolled into one place. I found my coffee twin. 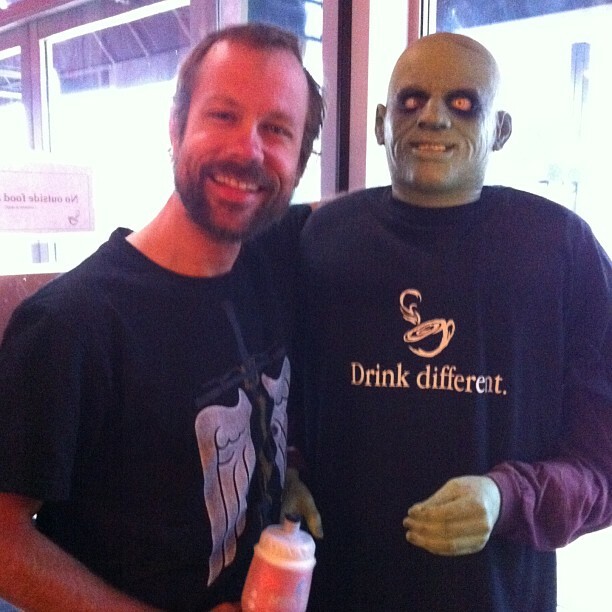 I found my coffee twin at the start of Day 3. Even with the light rain, it was still a beautiful ride and scenery. The only part that got kinda miserable was after the roads got wet enough that you were riding in the spray of the rider in front of you. In fact, there was a little bit of an internal battle to be at the front to get out of the spray! 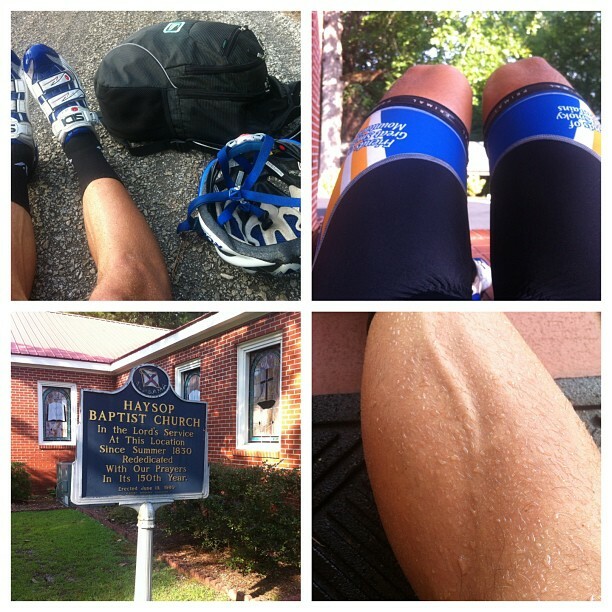 After the rain stopped, we absolutely drilled it averaging 25mph for over an hour stopping 90 miles into our ride at our final rest stop of the day alongside the huge Ross R. Barnett reservoir. After the rest stop, we split up into two groups which helped us negotiate the busier Jackson-area roads in the second downpour of the day. Our final rest stop of the Day 3 with Tim Hall pointing our location on one of the coolest maps of the trip – after we had been drilling it averaging over 25mph for over an hour! I was in the second group and we made it to the end of the day’s ride in Clinton, MS outside of Jackson, the first group (Tim, Travis, and Patrick) was on the ground doing push-ups as penance for leaving us behind! 90 epic miles with the addition of the exit ramp and return to trailer. 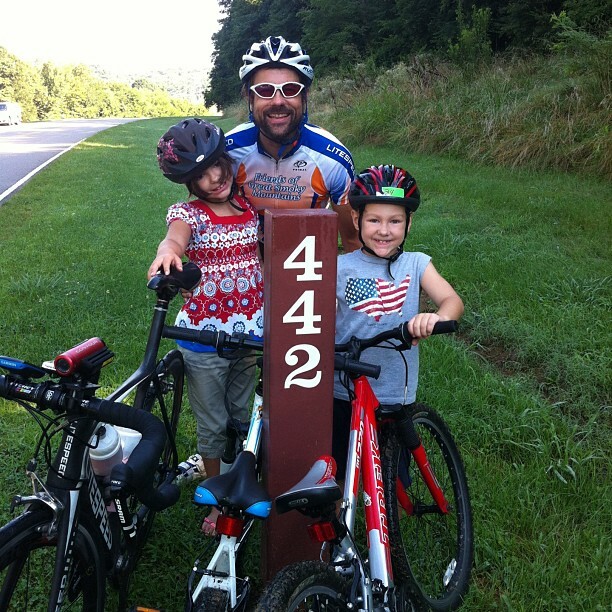 444 miles total on the Natchez Trace Parkway! We knew that this day would be shorter than the previous days, so we weren’t necessarily trying to lay down a new land speed record, but we still had a pretty good pace going. As we got into the rolling hills near Natchez, I realized that this was by far my favorite part of the entire trace. There was beautiful huge oak trees covered in Spanish hanging moss lining the roads providing shade. Plus, there was some good hills, and also we were almost finished! With exactly 5 miles to go, Rick and I were at the front and decided to pull for just 1 mile since we knew there would be a big sprint at the end. When we pulled off, the group strung out single file with Travis Werts in the front I believe. Then with about 2 miles to go, Philip put in a hard attack which I covered. When he started to slow down, I countered his move hoping to get a jump and hold it to the line. But even with an 1100+ watt jump (new power record) I couldn’t get a good gap on the group. So when the group rolled back up to me, I soft pedaled the front. That’s when Scott put in his perfectly timed attack. I wasn’t going to chase since I had just jumped, and everybody else looked at each other so Scott rolled away with the epic sprint win. The rest of us sprinted it out for second behind him with us all basically finishing as a group, but sprinting instead of rolling across the line in some sort of procession. Loved it. Perfect way to end such an epic ride for such a great cause! 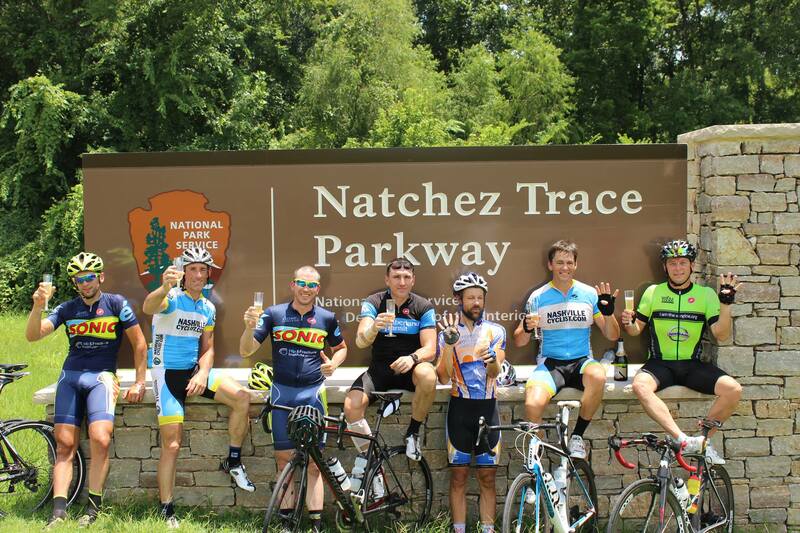 Celebrating with champagne at the finish in Natchez, MS! 87 epic miles. While the guys were getting ready for the long drive back to Nashville, I was prepping for the second part of an epic day – a ride to Brookhaven on the first leg of my journey home to Alabama. 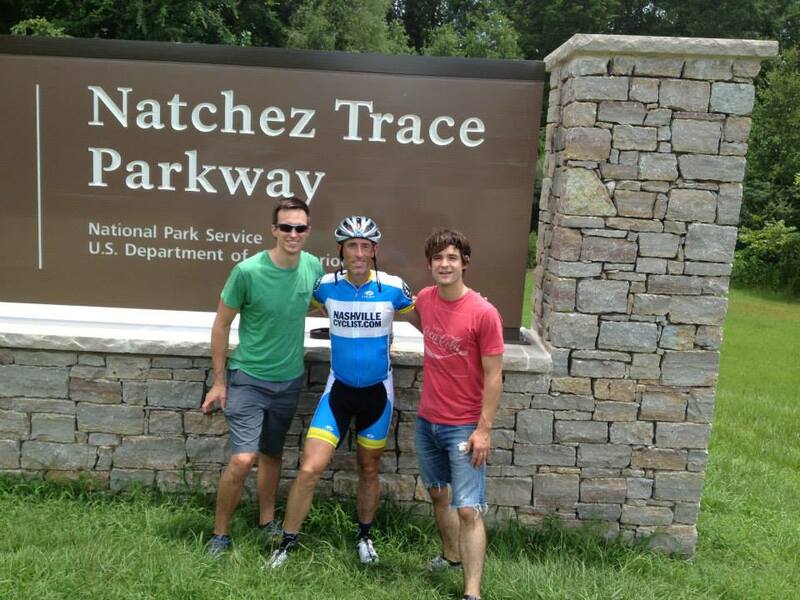 I was so pumped and excited after the finish of our Natchez ride that I think I underestimated a bit how hard the second part of this day would be. I started it out by riding across the Missisippi River into Vidalia, Louisiana so I could add a state to my ride and also get some good pics of the Mississippi River and the bridge across. Plus, this ride was a walk back in time as I had raced the Natchez Cycling Classic stage race back in 1994 as a junior and then again in 1998 as a cat 2 with my teammate from Clemson, Bert Hull. I rode the prologue portion of the course down to the Isle of Capri casino and then the steep climb back up the river bank. Tim Hall got this picture of me as I was getting ready to pull out – the backpack weighed about 10 pounds with my laptop, all kinds of cords and chargers (power, usb, etc…). This would be fine for the first day, but by the end of day 2 I was ready to be done with the backpack. 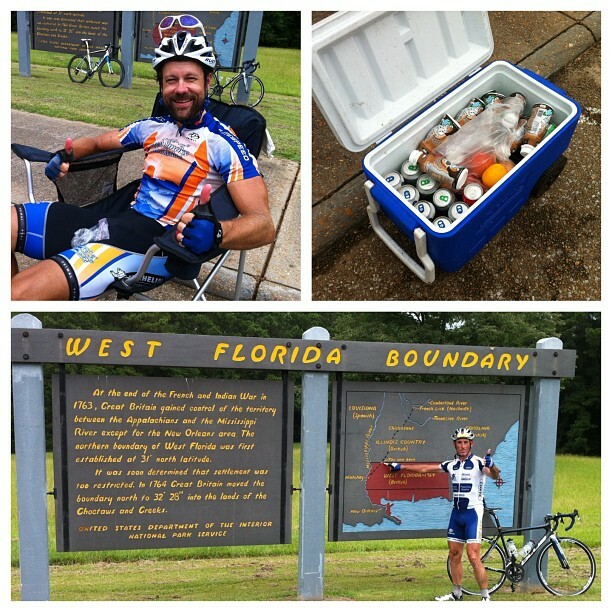 Day 4b – Tim Hall snapped this picture of me as I was just getting ready to pull out on my ride across the Mississippi River for a very short foray into Louisiana before returning back across again through Natchez all the way to Brookhaven, MS for a grand total of just under 176.8 miles for the day. I was on US-84 before turning onto Log Cabin Rd, which was really rough chip/seal plus sections of gravel where the road was gone. You had to pick your line a bit through here, but there was also a couple nicer short sections that had been repaved. I ran out of water through here, and given how hot it was and how dehydrated I was by this point in the day I knew that I needed to find water from somebody. I had planned on finding water in Hamburg, but there was nothing there. Most of the houses were abandoned or empty. Or because it was the hot part of the day, nobody was outside and I didn’t want to risk dogs and time going up to knock on houses. This was the only public structure I saw in Hamburg to give you an idea of how rural this place was. Finally, I found a man at the top of his gravel driveway and hollered out to him to see if they had any water. The man’s mother came out as I was riding up the gravel driveway, and she gave me lots of 1/2 liter bottles of water – enough to fill up both my bottles (44 oz) plus drink some right there. I told them I was ready to drink from the next creek I saw I was so desperate. We talked for a bit and when she found out about my ride, she said they were honored to have me stop by and get water from them. She grew up in Natchez and then moved out with her family to the country to raise some cattle and other farm animals. Refreshed and still full of energy I headed out on the next road (Oldenburg Rd) which was probably one of my favorite paved roads. Lots of short rolling hills and good pavement. At the end of this road, I turned onto Hospital Rd for a few miles north before hitting one of my favorite dirt roads of the trip – 15 mile creek rd. It was very rouge-roubaix like with hills (but not as steep as rouge-roubaix) and good gravel lines you could take around the turns. I had planned my route around how to get across one of the particular rivers that I noticed had very few bridges across it. 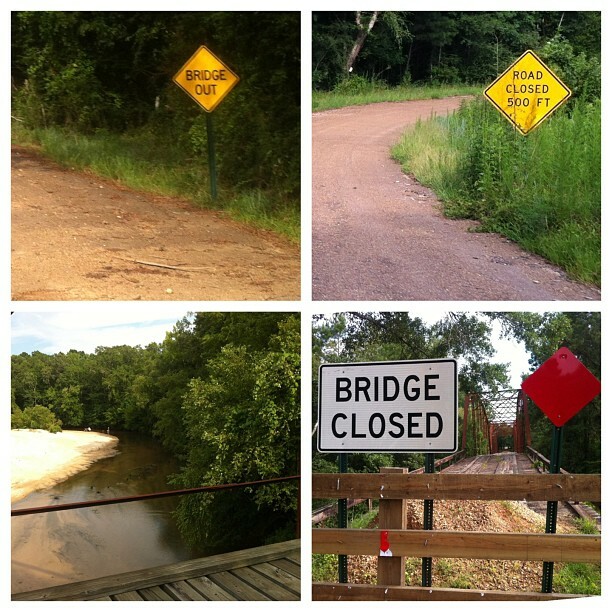 I ended up selecting Wright Rd, and sure enough as soon as I turned onto the road, I saw “bridge out” signs. Fortunately, I stopped an oncoming vehicle and asked them if you could wade across the river, and the lady and her husband said it was no problem that 4-wheelers drive across it all the time. When I got to the bridge, however, I realized that it was still intact and rideable if you were careful – one thin guard wire to keep you from falling into the river. This road was one of the bumpiest of the entire trip – see the bottom left picture of the instagram photo below. Day 4b – Wright Rd bridge out. 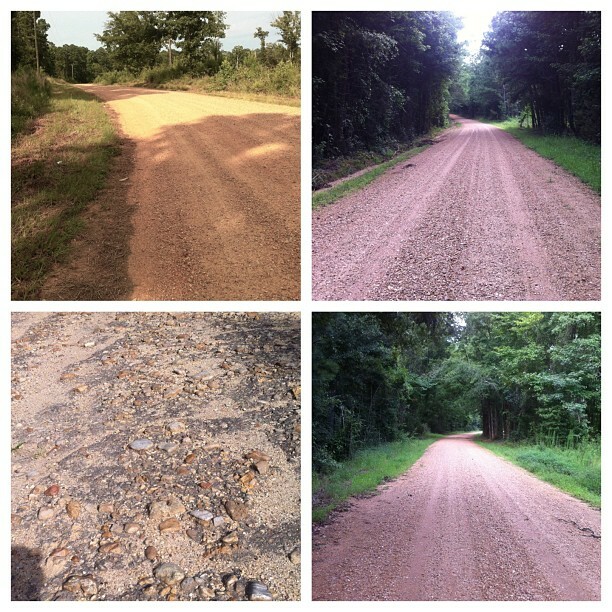 About a mile or so across the bridge on brutally rough pavement, I intersected with Choctaw Rd that was perfect dirt – far easier to ride than the Wright Rd pavement. I was actually quite a bit ahead of schedule because my GPS had routed me to Wright Rd and then u-turned before the bridge before routing back to the other side of the bridge adding 10 miles to the trip. When I crossed the closed bridge, this chopped 10 miles off my route. Trey had texted that he wanted to ride in with me, and we ended up meeting on Choctaw shortly after it turned from dirt back into pavement. I was out of water AGAIN when we met, and he had a full 24 oz cold/iced bottle of gatorade for me. It was perfect. We rode together through Brookhaven back to his house where we jumped in his pool to cool off and then ate BBQ paninis that his wife and mother-in-law had made for us. I ate SIX paninis. 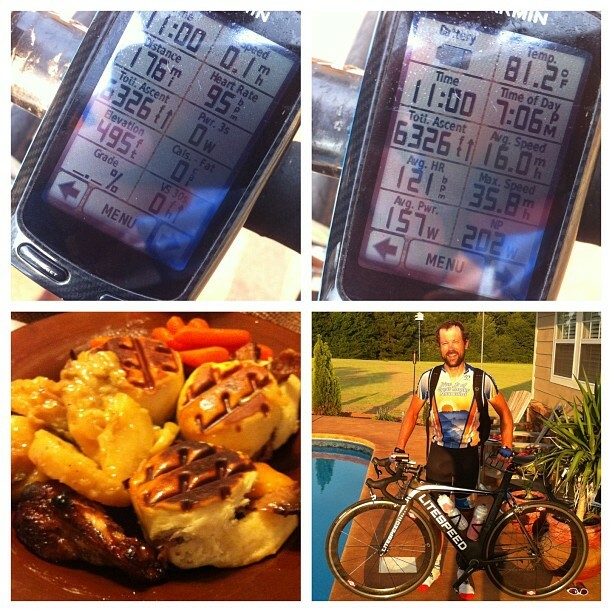 Day 4b – 176.8 miles of riding and lots of adventure! 153 hot miles. This day was the shortest, but probably involved the longest combination of rural roads. I spent the day tagging all my instagram photos #huntforwater because that’s what I spent a lot of time thinking about! Trey and I started out together leaving his house on the MS Gran Prix TT course, heading to the old MS Gran Prix RR course and riding Heucks Retreat road backwards on the course for a few miles before it turned into Bahalia Rd (dirt) for a couple miles. Then we wandered over on a nice, hilly (a few 12% max hills) road which eventually dumped us out onto MS-27 which Trey could take south back towards his house. I was continuing on east so we split up at that point with me heading east over the Pearl River. When I planned out my route a couple weeks ago, I had just assumed I would be able to find water whenever I needed it. This was a partially correct assumption. 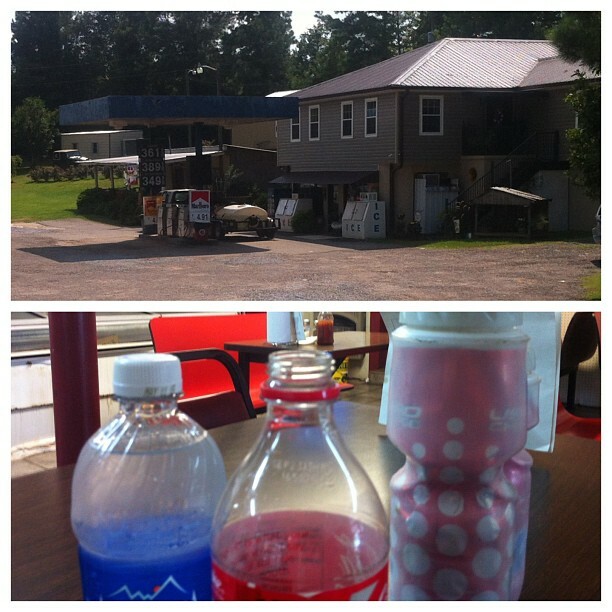 Just about every time I needed water, I would come across a gas station or country store. 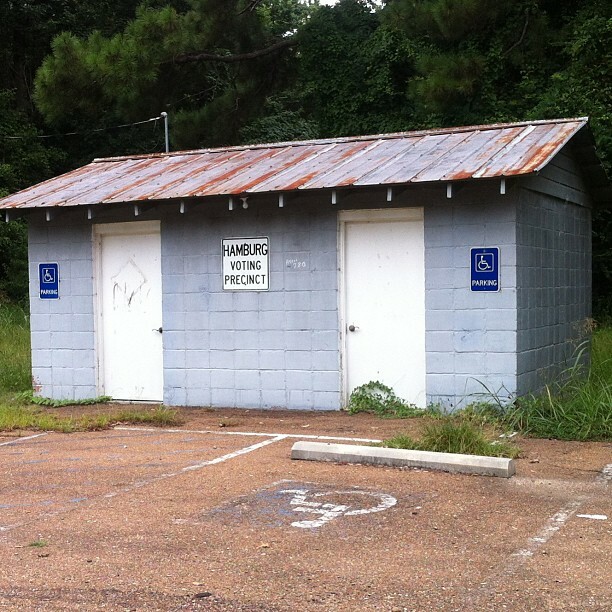 The only problem, however, is that those gas stations or stores would be closed, boarded up, and abandoned. 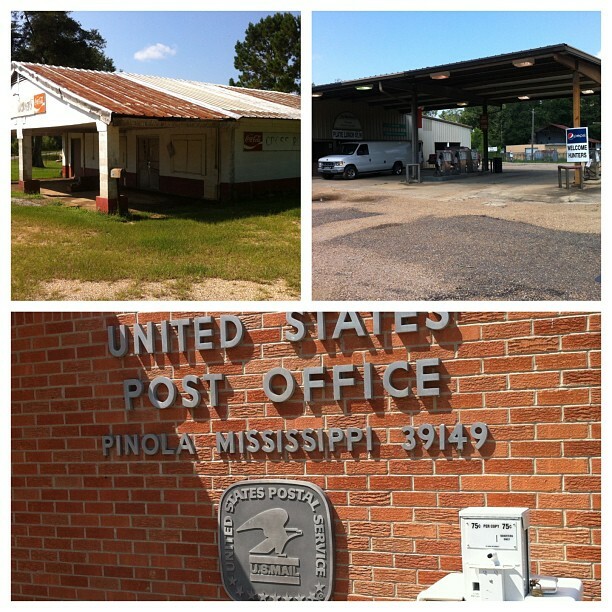 One town (Pinola) had two gas stations. One was closed permanently. The other was closed for remodeling. The nice lady at the post office though had cold bottled water she gave me – filling up both my water bottles (44 oz). The gas station that was closed for remodeling kept its large tanks above ground permanently – one labeled “REG UNL” and the other “HWY DSL”. First time, I’ve ever seen that. Still, the roads were absolutely amazing – some of them were really smooth chip/seal, others were a bit rougher, but all of them were crazy rural with maybe one or two hunting cabins dotting the entire road. I remember one stretch of road shortly after Pinola, which was perfectly smooth chip/seal and lots of rolling hills twisting and diving with lots of curves. It was a blast of a road to ride. 170 HC (hors categorie) miles. It’s hard to describe how hard this day was. I’ve ridden 250 miles in a single day before with 42,000+ feet of climbing. But that ride for the rapha rising competition in 2012 was “cake” compared to this ride. This ride was easily the hardest ride I’ve ever done. It was also the closest I’ve come to riding myself to hospital-level exhaustion. I laid down in the road twice, laid down on the stoop of a church once, begged for water twice, and involuntarily stopped riding twice. To give you an idea of how rural some of the roads were, I was probably laying in the road with my head resting on my helmet on Haysop Cemetery road for about 10 minutes. No cars. Just me and the flies, mosquitoes, and ants and I didn’t care if any of them bit me. Same thing just a few miles later at the historic Haysop Church (183 years old). Just laid on the front stoop thinking how beautiful the sky was and how pretty the cemetery looked and how on earth would I ever get moving again. I ate a payday candy bar when I first laid down at the church, and I think by the time I got up that had started to make it through my digestive system with some energy. Plus, somewhat miraculously as I was taking a picture of the Haysop Baptist Church historical sign, my daughter’s music started playing on my iphone … peaceful worship music from Christy Nockell’s Ever Lifting album. It was the sweetest music I’ve ever heard. This helped me get going again — plus a couple strangers gave me water along the road, which was very rough. My rolling average on Haysop Church dirt road was 11.5 mph (not including my stops) and then on the even rougher chip/seal torture road (Crystal Lake) I only averaged 9.5mph not including one stop along the road. The video below shows me begging for water from one car that rolled up beside me and stopped I was going so slow. Exhausted from the previous days riding I had slept in a bit (although fitfully waking up every time the air conditioner kicked on starting at 6 in the morning). I wish when I had first woken up at 6 that I had just gotten ready and left at that time b/c it would have saved me at least some of the heat-related problems I would have later in the day. As it turns out, I slept in until 7:30, ate breakfast at the hotel, and was rolling out of the hotel shortly after 8AM. The ride started out really well with lots of shade through a cool Meridian neighborhood on a road with some good hills and a switchback descent that crossed a major highway and immediately turned into really rough, rutted dirt/gravel. That only lasted about 200 meters before it turned into much nicer dirt and eventually into good pavement again after it crossed underneath I-20. The day turned bad, however, once I hit the US-11 / US-80 combo road about a mile later. This road was FILLED with logging trucks. No exaggeration, I probably saw 50 or more of them over the next 50 miles of the ride. But the problem wasn’t necessarily the logging trucks, it was the Wisconsin-style lateral cracks that ran the length of the road every 10 meters. Unlike Wisconsin where these cracks form due to the extreme cold, these were heat cracks caused by the expansion of the road under hot sun and then compression when it cools off at night. The 15 miles or so I had on this road until Alabama were really rough because of those cracks. But as soon as I hit the Alabama border, the road was beautifully paved with a perfect shoulder with a rumble strip about 18 inches of the white line so that I could safely ride to the right of the white line on a debris-free shoulder and still be left of the rumble strip. It was so hot and humid by this point that I couldn’t take iphone pictures without first stopping and pulling my tshirt out of my backpack to wipe the phone and my hands. Just constant streams of sweat pouring off of me and/or just rolling around on my skin. Not much shade on Hwy 11, but I made some really good time averaging well over 20mph. Then I detoured off of Hwy 11 at Livingston and headed over to Co Rd 21 which had some amazing views of the Tenn-Tom waterway from a couple hundred feet higher in the hills. 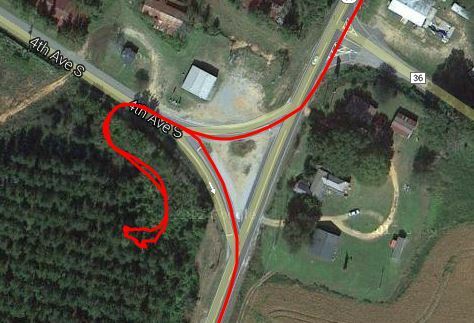 After Co Rd 21, I was back on Hwy 11 and almost out of water and the one gas station at the crossroads was abandoned. This, combined with a severe lack of shade, had me adjusting my speed to match any clouds that happened to be heading in my direction (fortunate). So sometimes I would slow down or even stop to make sure I didn’t outrun the shade provided by some of the thicker clouds. I’ve got some fun video of that if I can ever sift through it all and find it. 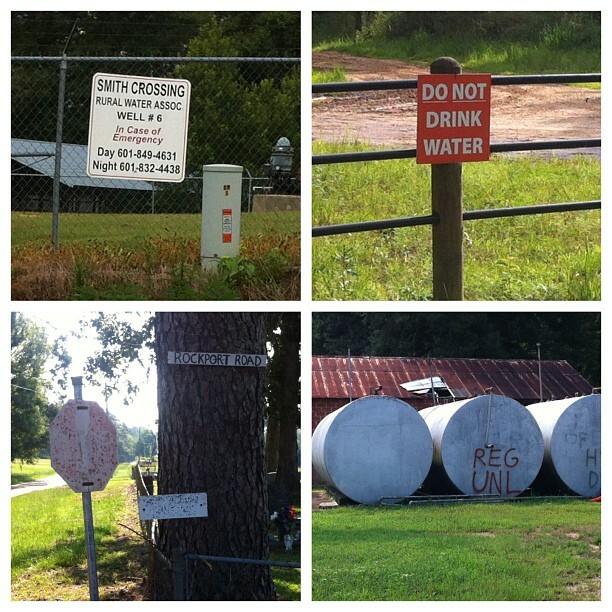 Eventually, I made it across the flat river floodplain and into Boligee. There I stopped and refreshed at the Boligee Cafe, where another customer asked me where I was going and when I told him he asked me what I thought about on long rides. I told him that about half the time was spent thinking / wondering / worrying about where I would find water next. I should have ordered a BBQ sandwich at the cafe but I wasn’t hungry. It wasn’t until about 20 miles down the road when I was hungry that I realized I didn’t have any bars or gels left in my backpack! At this point in the day, I was hot, starting to overheat, and out of food. Fortunately, I ran into a Dollar General at a crossroads where I got some ice cream and food and spent a few minutes in the air conditioning to cool off. I’m really fortunate because the Google satellite imagery shows me rummaging around in a forest where there was actually a Dollar General. I got pictures of the whole thing otherwise I think I might have second guessed that I was hallucinating and who knows what I was actually eating! My bike computer registered 101 degF by the time I started riding again in the sun. Interesting satellite view of my stop at the dollar general near Akron, AL – looks like it wasn’t there not too long ago. This was probably the first time I started to question whether I could make it all the way as I still had more than 90 miles to ride in what I knew would be hillier and hillier terrain. Sure enough, when I got to the Talladega National Forest outside Greensboro, the terrain started to get substantially more hilly. The problem was that it was early afternoon, and there wasn’t much shade. Plus, with a 10 pound backpack, I had a hard time making it up the hills at anything more than a snail’s pace so I wasn’t even getting a consistent wind from moving blowing to cool me down. Fortunately, at the Pleasant Valley crossroads, there was a thriving country store that was not abandoned. That store literally could have been a life-saver. 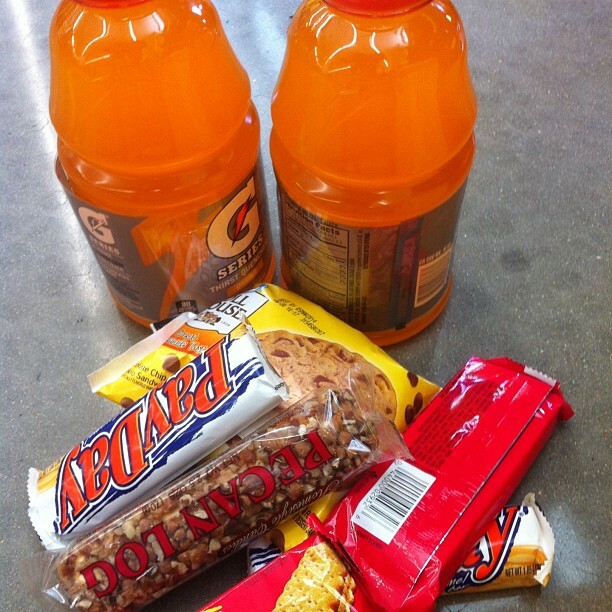 And this was ALL before I got to the even harder parts of the ride where I had to lay down in the road, etc… I hung out in the store for 30 minutes downing a cold coke and some water. The store also had 3G phone service so I instagrammed and facebooked a bit while I let my body cool down and let the sun get farther down in the sky. After about 30 minutes when I was actually starting to feel pretty cold/chilled, I decided to pack up and head on. I left the store, and headed north on perfect pavement of AL-25 … perfect until I hit the Bibb County border at which point the road became a very rough chip/seal for about five miles before I turned onto a county road which was perfectly paved again. Wonder if it was some kind of dispute between the county and the state over whose responsibility it was to maintain that stretch of AL-25. In any case, I was very glad to get off of it onto a nice county road. The warm sun felt really good through here, but I could tell that I was not doing well. I contemplated stopping at the bottom of one of the hills to rest before tackling the hill. That is not something I normally do. I opted instead to crawl up the climb at 5mph – a climb I could easily have done at 15+ mph without a backpack, without severe dehydration, and without 750+ miles in my legs from the previous days of riding. Through here I got an encouraging text from Boris saying that he was riding out to meet me on South Shades Crest. Then a little bit later when he and Nathan made it to County Road 1 and I was nowhere in site, he called and I told him that I was about 20 miles behind schedule. That was no problem for them, they just continued backwards on the route I had given them and eventually found me on Bishop Ridge Rd. This was after a stop in West Blockton where I got one last drink refueling – probably 300+ oz of fluid for the nearly 13 hour day. I gave my heavy backpack to Nathan and we started riding again. I was painfully slow on the uphills, but still able to drill the downhills … basically I could sustain about 150-175 watts and nothing more. On one of the longer downhills on Bishop Ridge, I was at the front drilling it down when I noticed a rough section of road. I pulled my big toes up (they were killing me) to relieve some of the pressure from the bumps, but in doing so I managed to lock up most of the muscle groups in my legs with cramps. Fortunately there was enough downhill left that I didn’t need to pedal and I was able to coast to a stop at the bottom where my legs had relaxed enough that I could unclip. I dropped the bike on the ground and fell over laying on the road (2nd time). I told Boris to call Kristine and tell her to come get me. A nice lady who came up behind us shortly after that stopped and asked if she could help or give me a ride to Green Pond. After a few minutes while Boris was still on the phone with Kristine, I decided to give it one more try. We were almost through the rough Bishop Ridge rd and onto the smoother, relatively flat Co Rd 12/13. We went slow enough at this point with Boris in the front, Nathan in the back, and me in the middle that I never felt any more cramps coming on. We even were able to make it up the Cat 4 Co Rd 52 climb to South Shades Crest where Nathan left us for his house. Boris and I continued on up to Hwy 150, left through the Preserve, and then through Green Valley finally making it back to the Krispy Kreme in Hoover located where the old Putt-Putt used to be right next to my old elementary school. Boris had arranged for his wife Hahn to meet him there to take him back to his house. This was a great place to end the ride. Definitely would not have been able to make it wihout Boris and Nathan. It started to rain as we were driving the three miles back to my house. 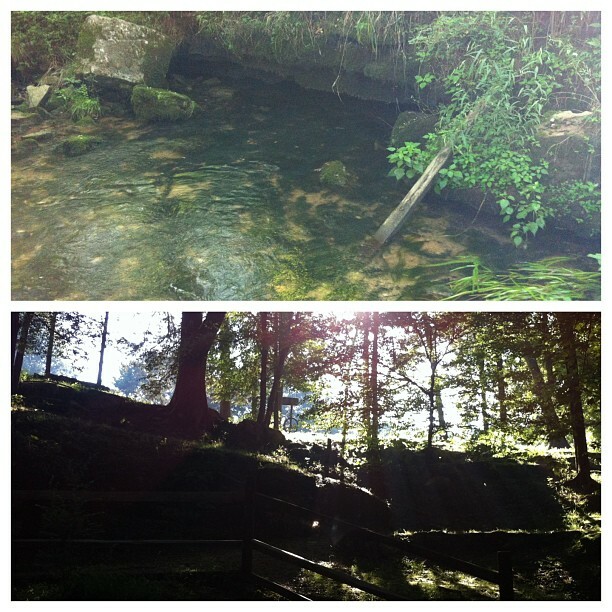 This entry was posted in Adventure and tagged epic444 on August 2, 2013 by kartoone.